Innovation. It’s a buzzword we’re familiar with as engineers, but how does it really fit in our day-to-day workflow? Understanding this innovation continuum and the principles that drive it is essential to making things. Innovation is something new or different that is introduced into the world. It is the birth of an idea that is not only contemporary, but life altering. In terms of production and design, innovation exists in many forms on a shifting continuum. The process can occur in tiny steps or appear in a sudden dawn of existence. We can innovate the created, or we can innovate through creation. Development occurs along this process and success trails right behind. The modern engineer is ripe with potential – potential that is silently waiting to be transformed into innovation. Innovation is not just a new idea or product, but something much more profound, enabling us to have life-changing impact on the world around us. An initial understanding of innovation brings us to a one-dimensional progression of production and design. This progression moves from impossible creation to required creation. Along this path, our innovation assumes differing levels of importance. The “sweet spot” of innovation occurs when a product is possible but uncreated. At this phase, suddenly a large market demands a solution, allowing us to engineer innovation at maximum value. A sizeable demand of innovation is certainly a driving factor to widespread adoption, but it does not diminish the importance of innovation on the extremes of the spectrum. Progress still needs to be made on the impossible and improvements still need to be implemented on the required. For the one-dimensional continuum, a product or idea undergoes each phase at different points in its life cycle. An innovation begins its life as an impossible idea that slowly progresses into something impractical, then finally becoming possible. For engineering innovation, things progress their way to possible through research and design. It is the latter half of the continuum, however, which defines the innovation. When a product shifts into the expected and required phase through continued innovation, it becomes a defining innovation to humanity. While certain innovations may garner more fame, innovations across the spectrum are to be strived for by us as engineers. They not only signify our abilities, but they earn respect and reflect an exceptional performance. Innovation isn’t just something to be strived for in the higher level of design; it’s something to be strived for in every choice we make. Understanding this one-dimensional continuum becomes rudimentary to facilitating growth and product success. However, as our perception of innovation deepens, so too does the continuum. We are greeted in deeper understanding by split factors along innovation progression. 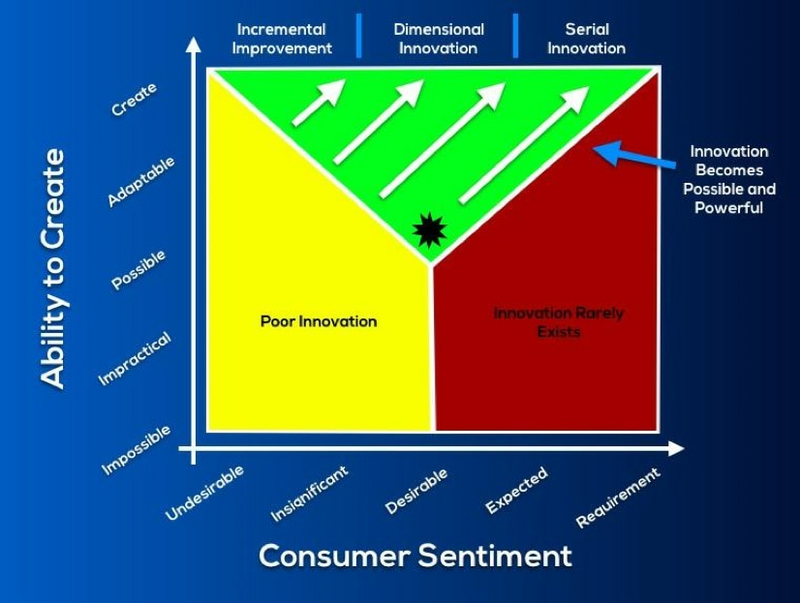 We begin to see that the innovation continuum hinges on two crucial axes, the first being the ability to create and the other being consumer sentiment. Focusing in on the ability for engineers to create, we are met with a range of possibility stemming from the impossible to the created. In other words, we can be met with creating something seemingly impossible, like time travel, or met with something created, like a car. Our ability to create a car is the highest it can be — after all, it exists. Subversively, our ability to create a time machine is in the lowest realm, as it appears impossible on a grand scale. 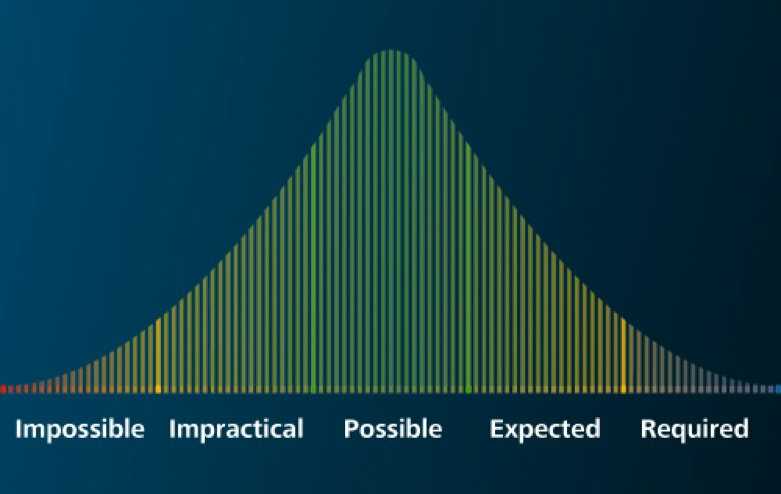 The bottom axis is arguably the most important consideration when driving innovation. Consumer sentiment encompasses the response the end user or driving users will have to a product or idea. These feelings can shift from undesirable to required and necessary to everyday life. For any product or design, the goal of engineers is to move it into the created and required zone. This makes our intellectual property required to the consumer and easy to implement from the manufacturer. Expanding the innovation continuum into this two-dimensional understanding creates a zone within the sequence we can refer to as the valley of innovation. It is the zone pictured in the representation of the continuum above in the shape of a green valley. This zone represents the ideal location for any given idea, product, design, or component if innovation is desired to occur. The sweet spot from a financial and influential perspective falls right at the base of the valley. In this sweet spot exists an idea that is fully possible and very desirable. Beginning innovation in this area is to be preferred. Innovations that are life altering begin their lives here, generally as inventions — things like cell phones, MP3 players, and computer-aided design programs. If a product can be produced in this sweet spot of innovation, the potential for it to progress to the created and required phase is at its highest. With this said, valuable and desirable innovation can and will occur in other areas of the valley, even outside the valley. We can take a product that is fully created but very undesirable and re-engineer it, iterate on our designs, improve it until we are met with a product that is more desirable and thus more significant. Conversely, we can also take a created product that is already required and improve its functionality or innovate an already essential function. Successful innovation will usually occur within this valley along the continuum. Outside of it, products are more likely to fail. As we move deeper into our understanding of Innovation, it’s important that we shift our understanding from that of its common use as a buzzword. Innovation can occur on the component level of a design. In this sense, consumer sentiment may only extend into a few people within a certain client's company. Further, it is often easier for us as engineers to take something from the impossible to created phase on a component level. Component and design innovation is perhaps even more important in a grander picture than is product innovation. It is the small component innovations made by mechanical and design engineers that we want to strive for. Through these small innovations, we can accomplish massive innovations as a team. Stepping back from successful innovation for a second, we can get a sense of why innovation outside the valley fails. Creating something that is possible or impractical, as well as being insignificant or undesirable, ultimately results in poor innovation. If we move to the other end of consumer sentiment, we are met with a region that rarely exists in well-organized systems. Rarely will we find ideas or products that are required or expected that are impractical and unfeasible. While government regulation and city code may be one exception to this region, innovation rarely thrives in this zone. So, as we strive towards innovation, how can we measure success and facilitate growth? Beginning development in the sweet spot is obviously the easiest way to begin on the continuum. This generally occurs as a new invention. However, some inventions can be poor innovators. Some inventions can be new, but ultimately are deemed undesirable. In this sense, they result in little movement on the continuum after initial creation. Where your idea or product falls on the continuum initially proves to be insignificant compared to its rate of change through the valley of innovation. Let’s examine this further. The MP3 player was a great invention. It solved problems, it met a need, and it was very desirable. Many companies created their own version of the MP3 player, each with varying levels of success. The invention of the MP3 player fell initially in the sweet spot of innovation. The successive versions of the design were each company’s take on moving this invention up the valley walls and towards the created and required zone. Each iteration progressed the device, but it wasn’t until Apple came along with the iPod that this invention was driven to be expected and required. Apple succeeded in advancing the initial MP3 innovation along the continuum, thus driving monetary success for their company. All of the companies started out at the same place on the continuum, but it was the systems set in place by Apple that improved the rate of change of innovation, ultimately marking success. Similar to beginning with a grand invention, a created and undesirable product can be valuable to us if we can innovate a desire for it and progress it through the valley. While the starting point is significant, it is the rate of change, the progress of innovation, that serves as the marker of innovative success. The actions taken by engineers to innovate fully depend on where the initial innovation begins. If we find ourselves innovating something found on the top left of the valley, we undergo a process called incremental improvement. In other words, we take an existing product and re-engineer it, iterating on this design until we make it desirable or needed. If we can move the product to this point, we begin engaging in dimensional innovation, if necessary. Dimensional innovations are the ones you hear about in the news, they radically shift a product or process and rapidly improve the way things are done. Dimensional innovation can occur initially, like the invention of the MP3 player, or it can occur to products already created, like the innovation Keurig machines brought to coffee makers. Keurig didn’t invent coffee makers, rather they engaged in dimensional innovation that rapidly shifted coffee makers through the innovation continuum. The final steps of perfecting innovation move into the serial innovation zone. Innovations that exist here function well and are already expected by the consumer. Addressing this zone means that we adapt and make small improvements. The innovations may be small, but they are equally important to the function of a design. We can view this serial innovation similarly to product optimization. Perfecting the idea until it is fully created and is a requirement to the maximum number of consumers. This continuum exists to understand the innovation that must occur for success in engineering both on the design level and the leadership level. If we understand the path that products must take through innovation, what factors do we then use to drive ideas down this path? As engineers, we have to put systems in place that allow easy progression of the design process synonymous with the important aspects of the engineering continuum. Systems like innovative software that enable us to find, make a product more desirable quicker. Or systems like 3D printing that enable us to rapidly manufacture a new innovation, allowing our rate of change of innovation to increase. Or finally, systems that are set to progress workflow like Lean Six Sigma Methodology, answering the question “how can we do things better?” Following the innovation phase through “define, measure, analyze, improve, and control” can radically shift our innovation capabilities. These systems can be anything from an innovative design process to a manufacturing technique. Whatever the system, it needs to be tailored to perfectly fit your needs and capabilities as an engineer, a company, and ultimately, an innovator. After developing and implementing systems, we have to infuse passion into the design and create ownership over the space. This is meant both for the engineer and for the consumer. If we can infuse a created but undesirable product with a function of passion, we gain added consumer sentiment, increasing our market availability. If we infuse passion and create ownership of the innovation in the design engineer – ourselves – our ability to innovate increases rapidly. Innovation, after all, is only brought about by human action – human action being largely driven by emotional input. Lastly, successful innovation is driven by our ability to utilize the effective tools and communicate effective ideas. This merges both system implementation and passion infusion to create ability. By making ourselves able, we allow ourselves to run faster, achieve more, and innovate successfully. Being able is perhaps the biggest driver to innovation, which is why investment in skills, systems, and passion is so crucial to engineering success. Whatever the size of the innovation, each progression through the valley produces a product or idea that is more innovative than its prior state. Moving forward on the continuum is an innovative engineer's daily task – a task that offers worldwide significance in virtually every venture.